You have reached the solution to connect to Zscaler, Skype for Business, Microsoft Teams, Office 365 and other Cloud Services in a simple way with maximum Scalability, Redundancy and Low Latency. Maidenhead Bridge, a partner of Zscaler, Microsoft and AWS has created the Cloud Security Connector (CSC) family that allows companies to connect to Cloud Services without hassle. Maidenhead Bridge delivers all products full configured in a format of Virtual Machine for Hyper-V, VMware, Cisco XE, KVM, etc; or any NFV platform. 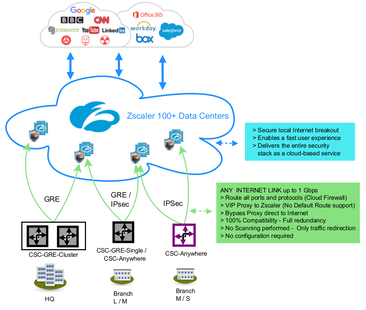 The family of Cloud Security Connectors: Multiplex, AWS, GRE and Anywhere, will allow you to connect in the fastest and easiest way to Zscaler. The Cloud Security Connectors are based in DevOps concept: everything is automated. Just fill a form with your IP data and download the connector with the perfect configuration for Zscaler. Learn more watching this 15 minutes video presentation. 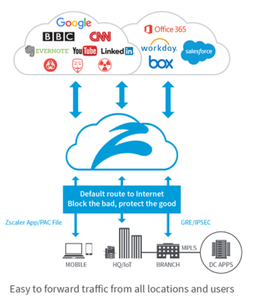 No networking knowledge is required to connect to Zscaler. Maidenhead Bridge simplifies the deployment of Zscaler Web Security.